The Government this morning released the National Statement of Science Investment 2015 – 2025, which lays out the priorities for investing government money in science and innovation over the next decade. I’ll leave analysis of the report to experts who the Science Media Centre has contacted for reaction which will be released later today. But regardless of whether you think science investment is going in the right direction, the document itself is a very good starting point for understanding our science and innovation system. There are numerous comparisons made in the report between New Zealand and five other small advanced nations – Ireland, Finland, Denmark, Israel and Singapore. These are useful comparisons, more so when it comes to science and innovation than comparing ourselves to all OECD countries. Having spent some time in Israel recently, where most of the start-ups I visited where co-founded by scientists and where university professors often spend part of their week working in the business sector, I can relate to the graph below. 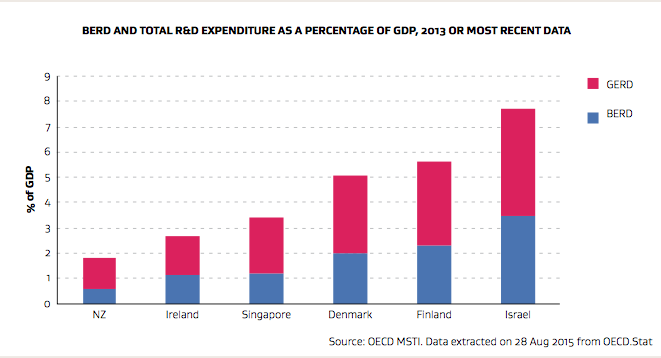 The other small advanced economies we like to compare ourselves to have many more people engaged in research and development in the business sector, even when population variations are taken into account. Israel for instance, has a population of 8 million but has around 65,000 people engaged in R&D in the business sector. New Zealand has around 9,000 (2012 OECD figures). 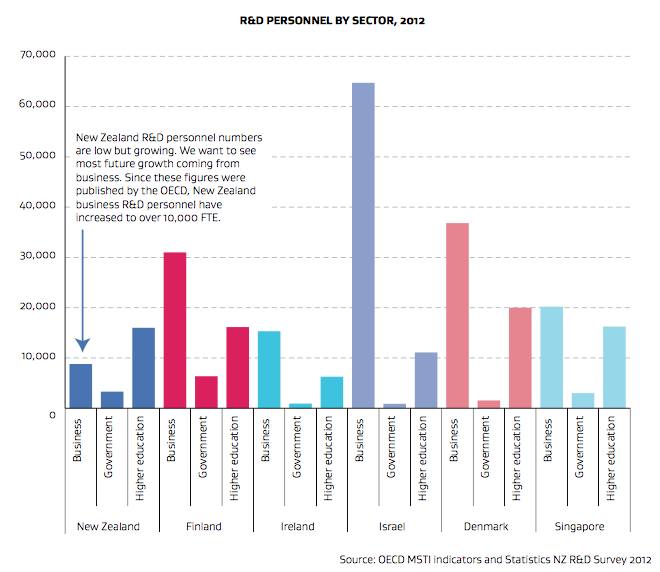 Not surprisingly then, New Zealand business spending on R&D is, as the report puts it, “particularly low”, hence the Government’s aspiration to lift it to one per cent of GDP by 2018. How do get that substantial boost in investment by industry? That’s the million dollar question. As everyone told me in Israel, it is about getting the ecosystem right – a pipeline of great ideas from our CRIs and universities that are worth investing it, incubators and accelerators spinning out viable fledging start-ups, multinationals keen to invest in R&D efforts here, foreign investors eager to co-invest with New Zealand venture capital companies and a skilled workforce supplying the industry with new creativity and capability. It is a lot to get right and there is more competition for investment and skills among the world’s nations than ever before. But we simply have to get the ecosystem working better than it is now to boost the business R&D investment and therefore the number of R&D workers in business. Back in the day in the USA, the SBIR grants really kicked-off the University:Business relationships. This structure is probably no longer in existence as it was at the time, but back then it fostered novel thinking by both parties. NZ might benefit from similar, so that in the first instance the mind-set is changed and useful channels of communication are opened. Once people get the hang of what it means on each side, how to communicate with one another, recognising different philosophies, and understanding the more subtle drivers and definitions of productivity on each side, then then it’s much smoother sailing. Right now we don’t talk to one another, it’s like we’re from different planets. And we need to talk and develop the relationships, there’ll be no twisting of research into a business endeavour and vice versa; I think the AgRes debacle is clear evidence that trying to morph one into the other is a ridiculous shambles. So, it’s time to recognise that both parties need to be at the table, and to provide incentives accordingly. It might also be useful to consider losing the get-rich-quick – innovate innovate innovate – mentality that seems to pervade all government pushes to fund research . Establishing relationships is all about patience.